Anyone who has children knows that childhood is fleeting. As a mother, I struggle with the rapid passing of time. Because of that, I aim to make each moment count. My husband and I are a bit old-fashioned when it comes to parenting. Yes, we embrace technology. We have iPods, iPads, cell phones, tablets, e-readers, televisions, computers, Netflix, and game systems. But there's so much more to life than electronic devices and media. What we really focus on is family togetherness. It's so easy for life to pass by quickly as we stare incessantly at our electronics. It's so easy to miss moments and build relationships. I don't want that to happen to my family, so we make rules regarding electronics and media. Family always comes first. We focus on LIVING life. We eat meals together while we talk about our day. We go outside. We spend countless hours with family and friends. We laugh, we play, and we watch movies together. We make memories. My 11 year old is one of the few kids in his class who doesn't have a cell phone. He doesn't NEED a cell phone yet. He NEEDS to have social skills and manners. My 8 year old and my 4 year old know that electronic devices aren't allowed when we go out to dinner together. All we need is crayons, food and conversation. 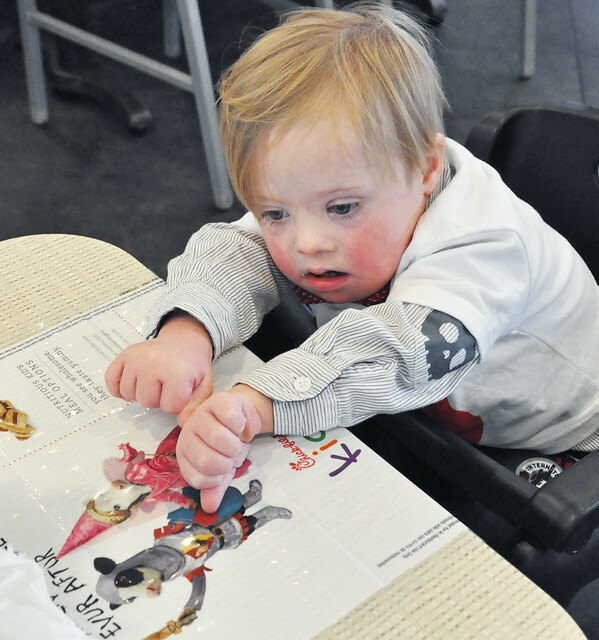 My 2 year old, who has Down syndrome, does not need to stare at a TV or an iPad. What he needs is interaction with his family and friends. That's what makes him thrive! I don't want my kids to grow up and measure their childhood by what they HAD. I want them to measure their childhood in all those memorable moments and experiences. Most of all, I want them to remember all the love that surrounded them on a daily basis! We don't give our children every single thing they ask for. We give them experiences. From going to our favorite zoo, to exploring new vacation spots, to chasing kittens around the stable where our horse is boarded, to seeing musicals and shows, to running in the rain together, to spending time with family and friends, to hours spent at the pool, to visiting our favorite parks, to having playdates at our favorite play spots, we are making memories that will last a lifetime! As much as we focus on family, building lasting friendships is just as important. My friends (AKA my "framily") are my anchor in life. Building these friendships begins in childhood. I often feel like my kids' social lives are busier than my own. There are just SO MANY PLAYDATES. I know it's just a phase in my life and we all know how quickly those phases pass. I'm not going to lie. We're logging in a LOT of hours at Chick-fil-A. It's THE hot spot for the under-6 crowd and their mamas! From playdates with classmates to playdates with cousins, Chick-fil-A is our go-to spot! We're not the only ones who love to eat there. Based on the fact that our local Chick-fil-A is ALWAYS busy, I'm going to bet it's the hot spot for many families! 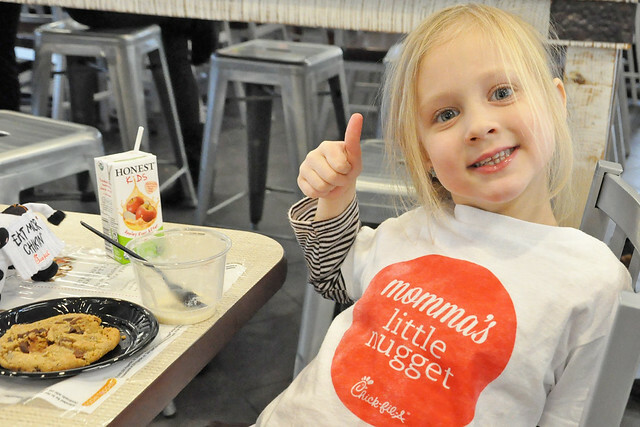 When I was a Mom Ambassador for Chick-fil-A of Pittsburgh in the Fall, I professed my love for Chick-fil-A in this post. We go there for the safe, clean, kid-friendly, welcoming environment and the top-notch customer service. There is truly no other fast food restaurant that even comes close to the quality food and service that Chick-fil-A offers. We've already made so many memories at Chick-fil-A. We LOVE their family events. We partied with them at our local zoo, we had the best time solving a mystery, we ditched an OT session for a Mommy-and-Me event (because sometimes you need to say no to a commitment and have some fun), and we regularly schedule and attend playdates there. When Lily hears that we're going to "Chickalay" she cheers! While Lily builds friendships with our family friends and her classmates and Liam waves to everyone who passes by, I get a chance the chance to catch up with my friends with minimal stress! 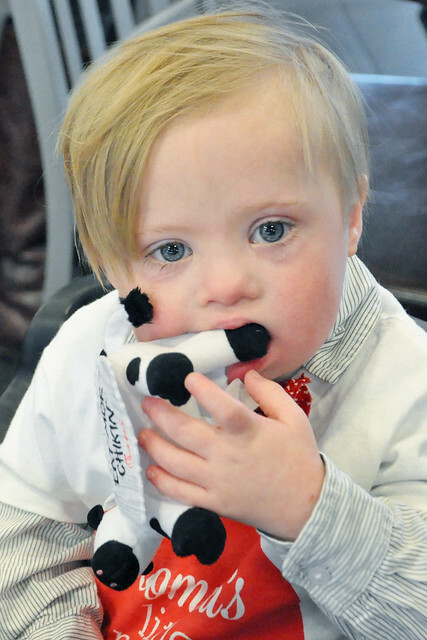 Mealtime is simple while we're at Chick-fil-A! We love the food, we love the environment, and every single employee makes it their mission to help you in every possible way. I was absolutely thrilled when I was recently asked to partner with Chick-fil-A again. I replied yes before I even made it through the entire email! 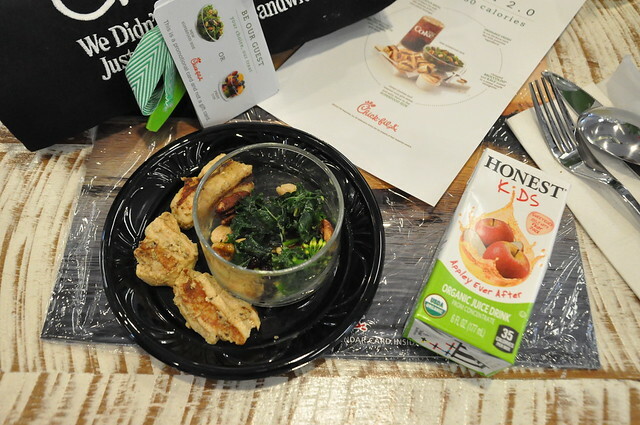 On January 18th, Chick-fil-A added its new Superfood Side and Honest Kids' Appley Ever After organic juice drink to their menu. A few days before the launch, Lily, Liam and I headed down to the beautifully decorated Chick-fil-A in Washington, PA, to attend a VIP #SuperfoodSide Tasting event. It was an adventure to get there (BAD GPS! ), but we breathed a huge sigh of relief when we spotted the Chick-fil-A logo in the distance! The Washington PA Chick-fil-A is relatively new and has the Heritage design. 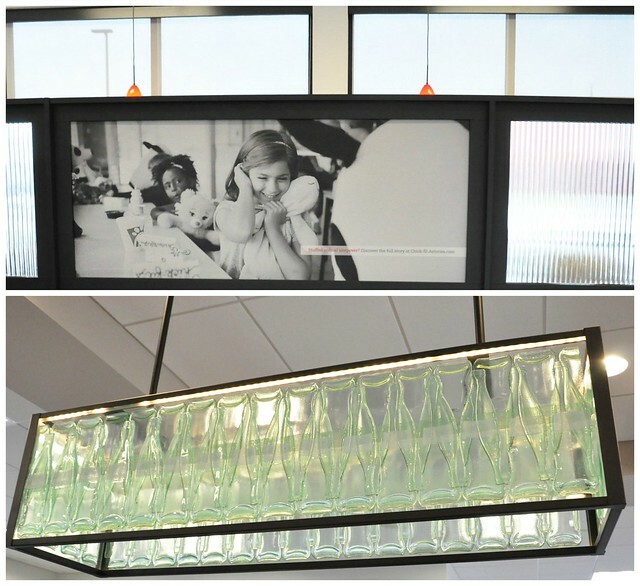 I loved the subway tile, the art, and the light fixtures made out of flattened coke bottles! We truly got the VIP treatment. Chick-fil-A didn't miss a SINGLE detail. 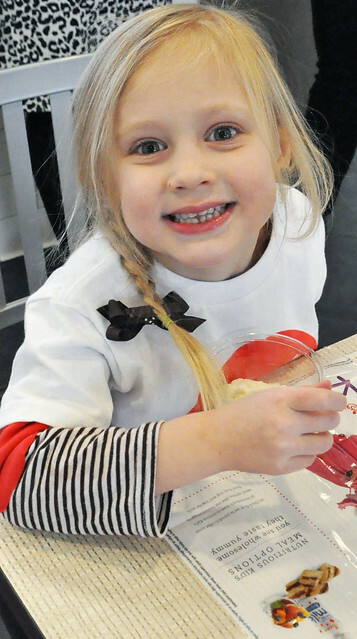 Lily was immediately offered a dish of ice cream which she happily accepted after a long morning of preschool, then she joined a few other kids in the play area for storytime and a craft! Liam wasn't acting like his usual happy, outgoing self. He wasn't quite ready to wake up from his nap, and he just sat quietly through the entire presentation. And, well, quiet is GOOD! I had the chance to try the Superfood Side at the Mom Ambassador kickoff in September, and I knew it was quickly going to become a favorite of mine (along with the Greek Yogurt Parfait, of course)! I was looking forward to trying it again! 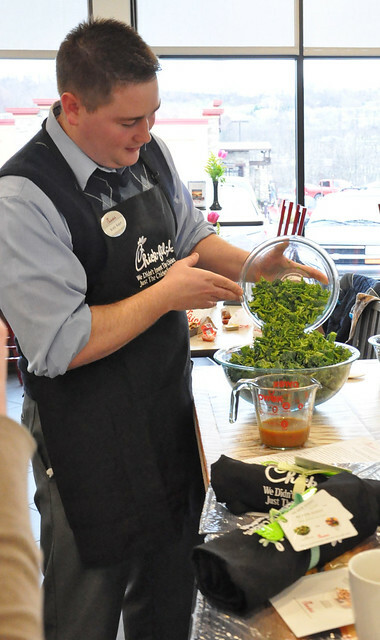 The Washington PA Chick-fil-A Operator, Kory Kaye, showed us how the Superfood Side was made and gave us the inside scoop on what makes it so delicious! Thankfully, we didn't have to wait the full half hour for the Superfood Side to marinate! They had it ready to go! 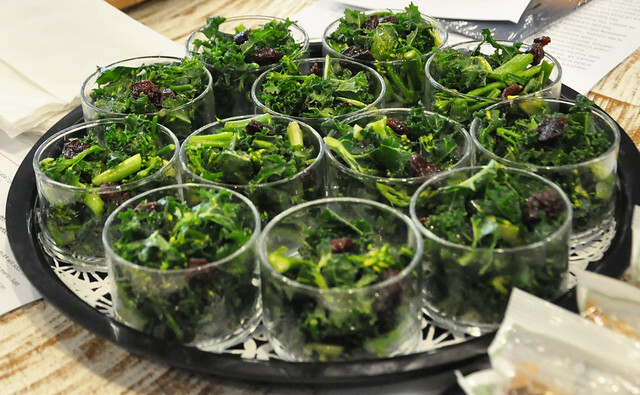 The Superfood Side is made from kale, Broccolini, and sour dried cherries, and is marinated with a sweet maple vinaigrette. You can mix in their Roasted Nut Blend for additional flavor. The nuts are packaged separately so people who have nut allergies can still enjoy the Superfood Side! 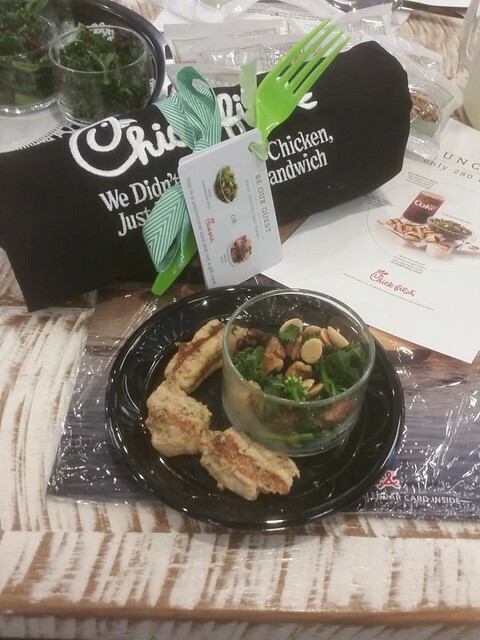 The Superfood Side is also delicious paired with Chick-fil-A grilled chicken nuggets! The two items paired together are only 280 calories. That's a delicious, healthy, guilt-free meal! These great additions to the menu make me happy! THIS is why Chick-fil-A is the fast food restaurant I choose for my family. The hour and a half at the VIP Superfood Side Tasting Party went by so quickly! It was so nice to see some of the wonderful people I met in the Fall again, and so nice to meet new friends! We had a great afternoon! Lily gave it an enthusiastic thumbs up! 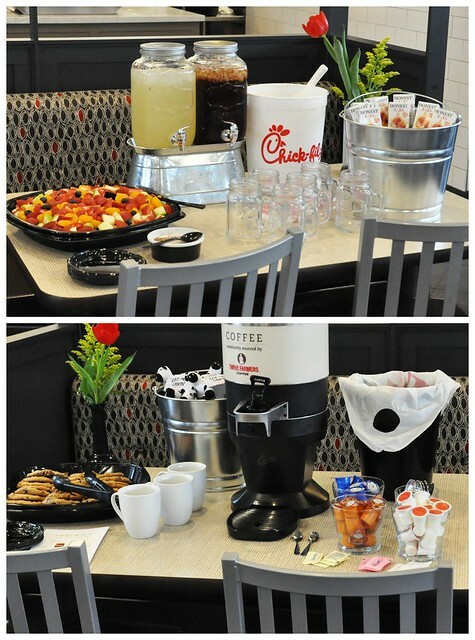 Chick-fil-A spoiled us that afternoon! Even as we gathered up our stuff to leave, the wonderful service continued. Did we want any food or drinks to go? Did I need help out to my car? Could they do anything else for me? Their kindness and generosity never ceases to amaze me! As we left the restaurant that afternoon, my sweet Lily reached up to grab my one free hand, and said, "Thank you! I had so much fun! This is our place, Mommy." It sure is! And I'm certain we'll return many more times! 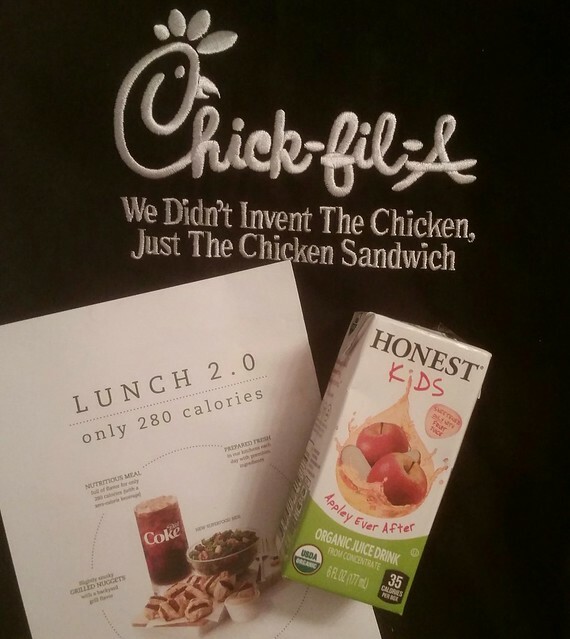 Thank you, Chick-fil-A, for sponsoring today's post! Thank you for listening to your customers, catering to families, offering a wide variety of delicious and healthy foods, and making continuous improvements to your menu. Most of all, thank you for helping my family make lasting memories! Have you tried the new #SuperfoodSide yet? *DISCLOSURE: This is a post sponsored by Chick-fil-A and The Motherhood. I only endorse companies and products I believe in and all opinions are my own. We spend SO much time at CFA too, ours is under renovation this month and I'm going through withdrawals :) They are always so kind! Oh no! I hope it's finished soon! It can't be beat, right?!? 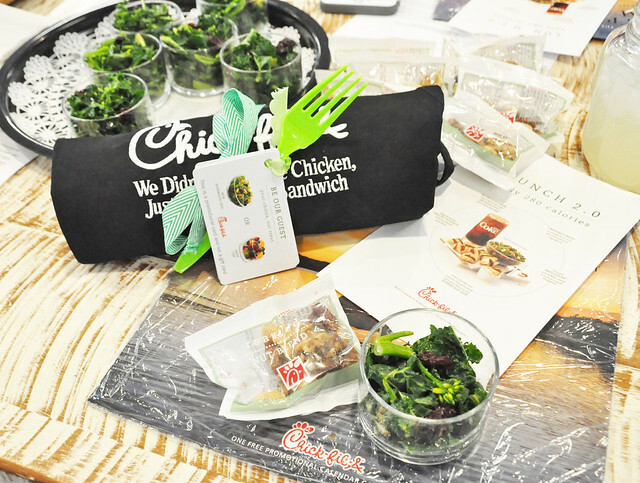 Your relationship with Chick-Fil-A leaves me green with jealousy. So very, very cool! I only endorse companies I believe in! I love Chick-fil-A so much!